Jacob Bertrand, Ciara Bravo and Jack Griffo wear black and blue high top and low cut Converse “Chuck Taylor” All Stars in the film. The Murphy family is Jinxed, and must move to Grandpa Murphy’s house when their is destroyed. Meg Murphy (Ciara Bravo) wakes up on the first day of summer. She goes downstairs and says good morning to her mother, father and baby sister. When Meg sees that her mom is making bacon for breakfast, her mother knowing Meg is not a fan of bacon, tells her there is cereal on the top shelf. Meg looks nervous; she gets a broom and tries to bring the cereal down that way. Multiple disasters happen, resulting in the Murphy’s entire home falling to pieces. Meg explains why this is no surprise to the Murphy’s. 100 years ago, a witch had cast a curse on the entire Murphy family leaving them jinxed forever. The curse was named Murphy’s Law, if something bad can happen it will. Being cursed has caused Meg to be one of the least popular girls in school. She has been nicked named “Hurricane Meg”. Meg is determined to break the curse before high school. But every time she brings it up neither of her parents want to talk about it. Charlie (Jacob Bertrand), Meg’s little brother, has used this curse to his advantage. He is known on the web as the “Internet Skate Fail Boy”, the boy who can never land a skateboard trick. Since the Murphy’s are now homeless, they have moved into Meg’s grandpa’s house in Harvest Hills. Grandpa has lived with the curse for the longest and has fully “Murphy Proofed” his house. Meg’s dad has also made something good out of this curse. Since it was hard for him to keep a job, due to accidents, he now has his own company. Meg’s dad gets paid to test products out to find any defects. Charlie is lying on the floor after trying a skateboarding stunt on the stairs. While walking the streets of Harvest Hills, Meg runs into Ivy Murray (Elena Kampouris). Ivy is the school’s “mean girl”, and has never got along with Meg. Ivy is upset Meg is here in “her town”, where she spends her entire summer. Embarrassed, Meg continues to walk down the street, she runs into Brett Taylor (Jack Griffo). Immediately Meg is head over heels for Brett, and is a little nervous around him. He asks her some questions trying to get to know her. Meg Realizes that Brett has no idea she is “Hurricane Meg” and that she can start new at Harvest Hills. An annoying bee is flying around Meg’s head. As she swats it away, she hits Brett hard in the face twice. In shock, Meg apologizes, Brett tries to play it cool, and says no worries. Meg has had enough of this curse. She goes home and brings up the subject of how to take the curse off. Right as Grandpa is going to say something about it, Dad stops him. Meg begins to guess what it possibly could be, and gets a clue that it could be a book. But, that is all Dad and Grandpa will say. Meg leaves the room promising she will find out how to remove the curse. Grandpa tells Dad Meg has no chance of finding the secret diary. As Meg is searching the house for any old books, she uses a lighter and ends up blowing up the basement. As she falls onto the ground, she sees a four leaf clover in a pile of dirt. She yanks the clover out, but its roots lift up some dirt and she sees something beneath it. Meg digs up the dirt and finds an old box. When she opens it, inside is an old diary. The diary belonged to her great, great grandpa Tommy Murphy. This is the book she was looking for. In Meg’s room, she is excited to read what the diary has to tell: how to break the curse. Charlie and Meg agree to work together to try and break the curse. As Meg runs out her room, one page of the diary is blown out of the window. On the street, her brother catches up to her and asks her for $50. Charlie wants to compete in a skateboard competition. Meg promises the money if he helps her take the curse off their family. She reads Charlie the diary, and explains to him that to take the curse off they would have to get the same exact coin Tommy Murphy had and give it back to a descendent of Kaitlin O’Leary. The balance of the film is about how Meg and Charlie attempt to do this. The main kid cast members, Brett, Charlie, Meg, and Ivy. Jinxed is a clever pre-teen movie, with tons of comedy and some teenage romance. Ciara Bravo plays the lead character, Meg Murphy, and really captures the difficulty of the last summer before high school, with the twist of being cursed. Meg has to overcome a mean girl and her first romance, while trying to fix a 100 year old curse on her family in an unfamiliar town. The scene of the Murphy family trying to deal with these freak accidents was pure comedy. Jake Griffo, who plays Meg’s crush, had charm and his looks fit perfect with the role. The message of the movie is to make the best of any situation. The Murphy family made the best of any extreme situation they were put in. Meg’s father built a business out of being cursed, and Charlie, Meg’s brother, became internet famous for being so unlucky. Meg’s parents taught Meg to accept the family curse, and make this unlucky situation into a positive. At the end, Meg won by accepting the curse as part of her, she gained a new best friends and her first boyfriend. The Murphy family with Grandpa. Charlie falls down after attempting a skateboarding stunt. Jacob Bertrand, Ciara Bravo and briefly Jack Griffo are seeing wearing black and blue pairs of chucks in the film. The best chucks scenes are when Charlie is skateboarding. 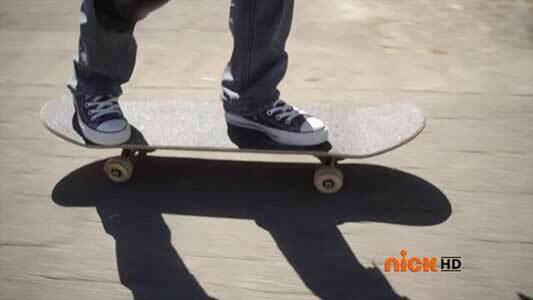 The camera shows close-ups of Charlie’s chucks when he is skateboarding. Jinxed. (2013) Ciara Bravo, Jacob Bertrand, Jack Griffo, Burkely Duffield, Elena Kampouris. Directed by Stephen Herek. Categories: Comedy, Family.